The Contractor Series 5 ft. Left Drain Walk-In Whirlpool and Air Bath Tub in White provides a safe and independent bathing experience in a cost-conscious package. Using the latest in tub-crafting techniques and industrial-grade materials, this fiberglass walk-in tub from Universal Tubs offers an impressive array of features to melt away your worries and aches, including 18 air bubble injectors and six multidirectional water jets for invigorating massaging action. With an ADA-compliant moulded bathing seat, safety grab bar and low-threshold entry, this whirlpool and air bathtub offers the convenience and peace of mind needed for bathers of all ages to truly enjoy a luxurious soak. Walk-in bathtubs offer a safe and independent bathing experience. This 4 ft. 6-inch tub will meet your specific needs, with its high-quality materials. Wheel chair accessibles provide a safe and independent bathing experience. Using the latest in tub crafting techniques and industrial grade materials wheel chair accessible tubs offer an impressive line to meet your specific needs. With ADA compliant designs and features, wheel chair accessible tubs offer the satisfaction and peace of mind needed to truly enjoy a luxurious soak or a vibrant, soothing experience. 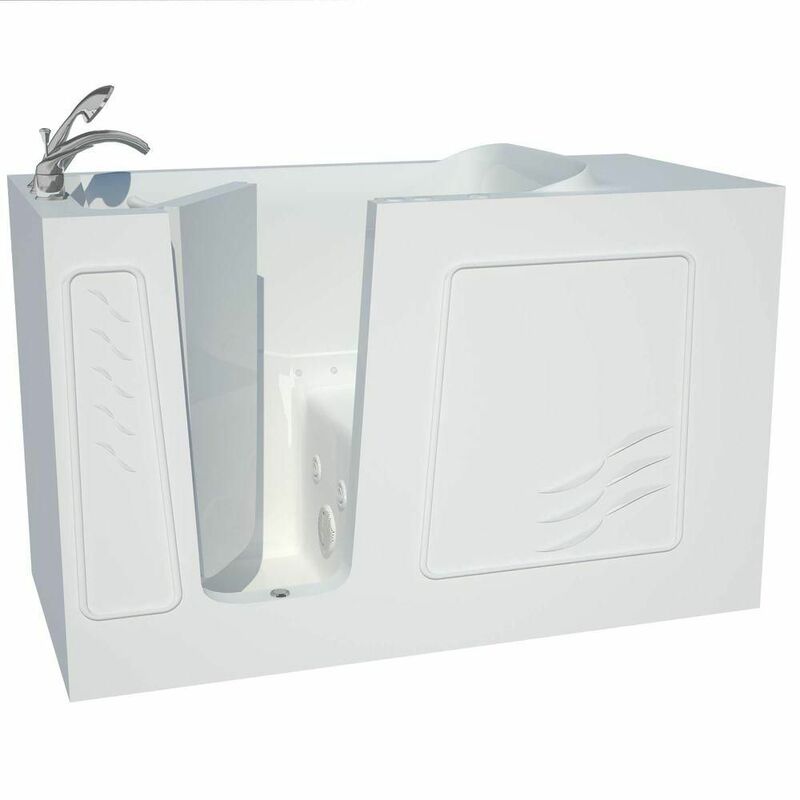 Contractor Series 5 ft. Left Drain Walk-In Whirlpool and Whirlpool Air Bath Tub in White The Contractor Series 5 ft. Left Drain Walk-In Whirlpool and Air Bath Tub in White provides a safe and independent bathing experience in a cost-conscious package. Using the latest in tub-crafting techniques and industrial-grade materials, this fiberglass walk-in tub from Universal Tubs offers an impressive array of features to melt away your worries and aches, including 18 air bubble injectors and six multidirectional water jets for invigorating massaging action. With an ADA-compliant moulded bathing seat, safety grab bar and low-threshold entry, this whirlpool and air bathtub offers the convenience and peace of mind needed for bathers of all ages to truly enjoy a luxurious soak.